Thanks to Werner Bloos there is a German version of ASSIST here. ASSIST is a Java application designed to make the process of installing SDM Version 2.1 on your Canon camera as simple as possible. It does for SDM what my STICK app does for CHDK. If you don't have Java installed, here is the official download site for Windows and Linux. For recent versions of Mac OSX (Yosemite and later) you need to install legacy Java 6 from Apple here..
and copy the appropriate files to the card. The cameras that SDM Version 2 supports are listed here. ASSIST runs under Windows (from XP onwards), Mac OSX (from 10.4 onwards) and Linux (Ubuntu 11.x and 12.x at least). To make things as easy as possible all you have to do is press a button to make ASSIST continue to the next step and on-line help is just a button-click away. Here's a picture of ASSIST just after a photo has been dropped. 'asseng32.dll' and 'asseng64.dll' - dynamic link libraries containing java native methods for Windows (32-bit and 64-bit versions). Double-click the appropriate script file depending on your Operating System. See the notes below for information about giving ASSIST permission to modify a card (this applies to OSX, Windows and Linux). ASSIST can't currently reformat exFAT cards as FAT32 or repartition them into FAT16 and FAT32 partitions, at least not reliably. If ASSIST finds an exFAT card it will will issue a warning message, asking for another card to be inserted. In such a situation reformat the card as FAT32 and try ASSIST again. Note that Windows cannot format cards bigger than 32GB as FAT32 - if you have such a card try one of the 3rd-party formatting tools such as this one or this one. ASSIST does not copy all the files to the card, only DISKBOOT.BIN and the contents of the SDM folder. 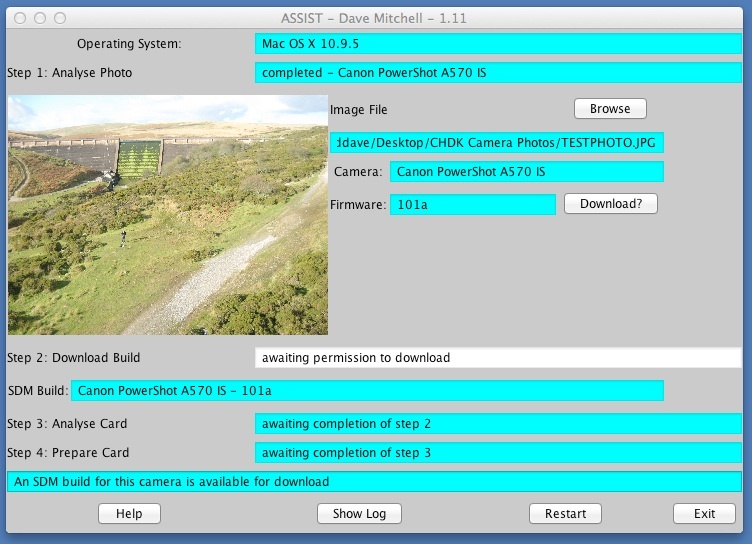 The remaining files are retained in a sub-folder of the assist folder whose name is the model name and build of the camera (e.g. "a570-101a). Note - the Common_files folder contains the SDM User Manual and other documentation. ASSIST will also detect if a build has been previously downloaded and if so, let you skip the download step. This can be useful if you want to prepare another card for your camera, but of course skipping the download step may mean you don't get the latest SDM build. Starting with Mountain Lion (10.8) OSX requires root access to make changes to cards. As a result, ASSIST will fail with a "permission refused" message unless it has root access. To run ASSIST under these versions of OSX (Mountain Lion, Mavericks, Yosemite, El Capitan and later), use the assistML.command script. Double-clicking the script will bring up a terminal window and sudo will ask you to type your logon password so ASSIST can get root access. ASSIST will run when you press return. Some Windows 10 users have reported that they needed to use 32-bit Java, not 64-bit java. For cards larger than 4GB in pre-2011 cameras, ASSIST will create two partitions - a small FAT16 one containing DISKBOOT.BIN and a large FAT32 one for photos. Note that Windows will only let you see one partition at a time - use my WASP utility to switch between them. If you see this message, or are running a 64-bit Windows system, terminate ASSIST and double-click the ASSISTX.CMD file. This will display a dialog allowing you to temporarily 'elevate' yourself to Admin level by selecting a user account with these privileges. ASSIST will then run properly. Unfortunately this temporary elevation breaks drag-and-drop (it's a known Windows problem) so you will have to use the Browse button to locate a photo. Different flavours of Linux use different formats for the names of removable drives. Although ASSIST tries its best to parse such names, it sometimes fails - my apologies! which sets the limit at 64000MB or 64GB. Changing it to 32000 would make the limit 32GB. which sets the limit at 4GB cards. Changing it to 2000 would make the upper limit 2GB, so that 4GB cards would have to be formatted as two partitions. which sets the size to 16 MB (plenty large enough to hold DISKBOOT.BIN). Changing it to "1G" would make the small partition 1GB in size. but fontname can be set to "Serif", "Monospaced", or the name of any of the installed fonts, such as "Century Schoolbook". You can see the names of fonts by selecting the Font menu option in a Text Editor. Note that the log is written to a file ('assistlog.txt') when ASSIST terminates. The properties file also remembers the size and position of the window ('height=...', 'width=...', 'xpos=...' and 'ypos=...'). 1.04 - February 2013 - support SDM 1.86 rather than 1.85. To download an SDM 1.85 build, go to the old SDM download site. There's a companion app, STICK, which will install CHDK in just the same way.